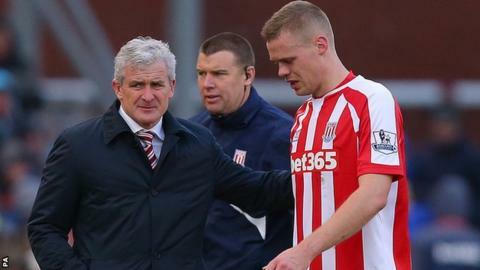 Stoke City captain Ryan Shawcross says he is on schedule to return to action following successful back surgery. The once-capped England centre-half, 27, had an operation at the start of August, having aggravated an injury that caused him to miss the final six weeks of last season. "I went to see one of the best spinal experts in the world. And I'm pretty pleased with how it's gone," he said. "I've started jogging and am swimming a lot. It's a step in the right way." However, Shawcross did not give an indication of exactly when he would be ready to play again. He told BBC Radio Stoke: "You don't want to rush too much as you can end up putting yourself out for a long time. Especially with the spine, you have to be very careful. "It's an injury I'd managed for a number of years. I had a slip against QPR, which the injury originated from, then I had a recurrence of it in the summer. I had a go in pre-season but I came to the decision with the manager (Mark Hughes) that it was time for the operation. "I was struggling to walk, struggling to move. It was a case of making sure I got the right surgeon and got the correct treatment." Shawcross has made 319 appearances in eight years at Stoke since the Chester-born defender left Manchester United. He managed an hour of action for the Potters in pre-season before undergoing the operation. Stoke have suffered a disappointing start to their Premier League season so far, sitting in 18th with just two points from four games. They have drawn both their away games, at Tottenham, coming from two down, and Norwich. But Mark Hughes' side have been out of luck at home, losing twice, thanks to Philippe Coutinho's late winner for Liverpool and two contentious red cards against West Bromwich Albion, when they had to play more than half the game with nine men.